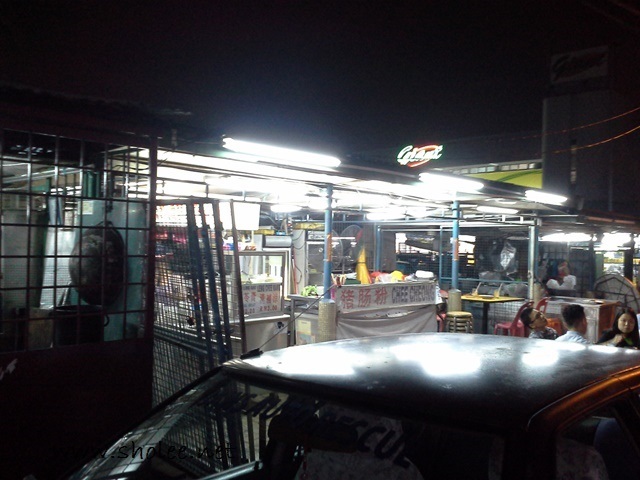 The stretch of food stalls here looked unassuming but it's always full with patrons. From 'dai chou' to 'chee cheong fun' to some other varieties which we don't know since we can't read Chinese, we are definitely spoilt for choice. 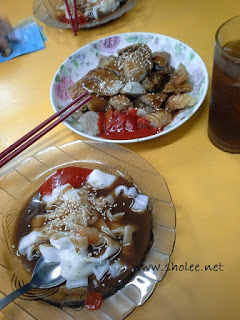 In the end, we decided to try this chee cheong fun with leng chee kang stall. It's in the middle, or rather the second stall from Giant. For a total of RM12.60 for 'chee cheong fun' for 2 pax and 2 glasses of chilled 'leong sui', it was a hearty meal and worthy too. I liked the fact that they heated up the noodles and ingredients including the gravy before serving it to us. Though the black sauce tasted a little bland, the chilli totally made up for it as it was spicy! No high expectations here, just a simple meal with a quiet road side ambiance.